The sky is no longer the limit for innovative technologies produced by Pratt & Whitney Canada (P&WC). PW308, a P&WC engine, is an integral part of the world's first commercial flight to space. This turbofan engine will propel the launch aircraft, WhiteKnightTwo, for the world's first commercial passenger suborbital spaceship, SpaceShipTwo (SS2). The PW308 benefited from Technology Partnerships Canada (TPC), which made a $99.4 million repayable contribution in the engine's research and development in 1999. The PW308 turbofan engine was originally developed over several years for use in civilian aircraft. It has been used in business jets, including the Hawker 4000 and the Dassault Falcon 2000EX. Led by The Spaceship Company (TSC) — a company jointly owned by Virgin Galactic and Scaled Composites — the flight of SS2 and its voyage to space is the first venture of its kind. The WhiteKnightTwo is a massive carrier craft powered by the PW308 which takes off like an airplane with the manned SS2 attached underneath. It will be launched into suborbital space once the airplane reaches approximately 50,000 feet. The air-launched SS2 is designed to seat eight people—six passengers and two pilots—and be hauled into launch position by WhiteKnightTwo. Flights cost US$200,000 each, and TSC has already received US$35 million in deposits from future passengers. 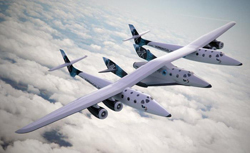 Virgin Galactic is also planning other applications for WhiteKnightTwo, including unmanned satellite launch vehicle deployment, high altitude and space science applications and other payload deployment roles. The PW308's cruise thrust, fuel consumption, and power-to-weight ratio is considered the best in its class. In addition, P&WC, in collaboration with TSC and Virgin Fuels, is investigating the possibility of using advanced biofuels in WhiteKnightTwo. This will further reduce the engine emissions of the most environmentally-friendly launch system ever created. TPC investments were directed at increasing the knowledge base of the company in both engineering and manufacturing technologies, allowing it to advance these technologies and develop more reliable and efficient engines. Since 1928, P&WC has become one of the most significant players in the A&D sector in Canada. With facilities in Quebec, Ontario, Nova Scotia and Alberta, P&WC employs over 7,300 people across the country. For more information about Pratt & Whitney Canada Corp., visit the company's website at www.pwc.ca.